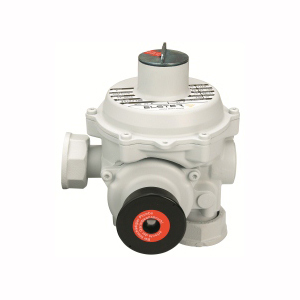 The two stage pressure regulator M2R (DIN-DVGW approved) is designed for domestic to industrial applications. It is suitable for town gas, natural gas, air and LPG. The modular concept of the regulator makes it possible to realise a wide range of different types of connections. The resetting and adjustment of the safety shut off valve has a very user friendly design and is designed to prevent third party manipulation. The M2R can be used for indoor or outdoor installations. Outlet pressure range 1.2 to 40 kPa, inlet pressure range 10 kPa to 500 kPa typical capacity 25 m³/h from 50 to 500 kPa. Inlet pressure resistance up to 1600 kPa.